But actually they do not come from either of these things. 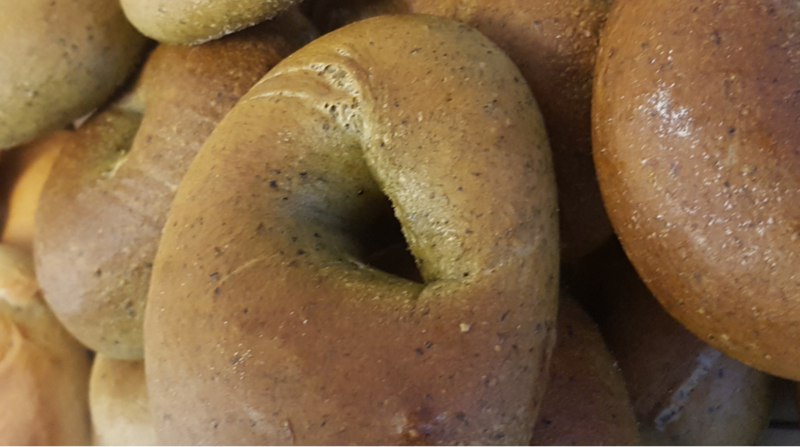 Rather than being created as a present for the rich, or under times of famine, the bagel was created to remember how people helped each other at the time of the floods. Many moons ago, beyond the high plain and low in the valley floor, beyond the mountain of the eastern shore, was a small village of farmers and crafts people deep in the Forests of Avalene. One new year’s eve morning, as the skies were brightening, Grandma Beigel started her daily making of bread. She kneeded and pumped and folded and punched the stiff dough until it was elastic and airy and set it aside to rise some more. Then she set about making some tea for grandpa, and baby Shmuel, who Ruth had left with them while she went to market. Meanwhile far from the forest and across the high plain and beyond the mountain of the eastern shore, a sudden trembling was felt for many miles around. The crust of the earth opened up and the sky darkened, crows squeaked menacingly across the plains and far in the forest the trees swayed as if to warn of the danger fast approaching. Slowly, from the gaping crust came water -gallons and gallons seething its frothy path across the plains, steaming with energy and falling across to the valley below. In the forest birds rushed from the tree tops and hailed a danger. Grandma Beigel went to see what was happening. As people are not as clever as birds she heard nothing and saw nothing to worry her and thought it was just the birds squabbling amongst themselves. Just on the edge of the forest the rabbits felt the earth trembling beneath them and started trembling themselves – with fear. Badgers began to feel it too and came out of their setts to scramble across the forest floor. Then the wolves started howling and the squirrels scurrying and spiders gathered in their silen webs to set up home elsewhere. Grandma Beigel saw this commotion, and heard the noise of the birds, and started now to think something was really wrong – because while people are stupid she was not as stupid as many and always thought to listen to what the animals were saying. She listened hard and felt the earth shaking and the dreadful thunder of the water approaching down the valley to the forest. She heard the first trees at the edge of the forest crash beneath the force of water and knew she had to save herself baby Schmuel and grandpa. But what could she use? Grandma Beigel was well respected as the wise person in the village. Soon even her neighbour knew something was wrong and she came round to Grandma Beigel’s cottage and then her neighbour’s neighbour too and so on till soon all the village was in Grandma Beigel’s little garden. What shall we do what shall we do they cried. And all the while the noise of the approching water coming closer and more thunderous. Grandma Beigel said they could come up with a plan if only they all stopped their shouting. They needed boats but they had none being so far from the sea or lakes. Then Schmuel crawled in with a toy he used in the bath. And with this Grandma Beigel new she would be able to save them. We all have bath tubs she cried. Gather your families in the tub and we will be fine. All the people of the village rushed to their homes and found thier tubs. Grandma shouted to grandpa to wrap the baby. And soon everyone was ready. Meanwhile the water thundered closer, trees crashing and birds squeaking up in to the air. The noise made Grandma Beigel’s cottage shudder, the crockery was shaking and the cutlery was clinking. Oh dear oh dear what will become of us she cried to herself. And what happens if baby is swept away? It was then she remembered the rising bread and had a funny idea. She took the dough and wrapped it in a big chicle and when grandpa came in placed it around baby’s waist. It was of course full of air and while it might not hold her or grandpa, baby was smaller and would help him float. She felt a surge of life pass through her. She was in control. She knew what to do. She had the dough and made a ring for all the babies in the village and even had some left over for the old people who could not swim. Quick quick cried Grandma to the slow coaches. They all climbed in the tub ready for the worst just as the water crashed by and gushed great jets into their cottage. The tub bobbed and then sped along with the current, trees bashing it first on one side and then the other, they were shoved hither and thither never steady always toppling and then a great wave and the tub went over, grandma and grandpa and baby and all the others too. oh oh oh they cried – though not baby as he could only gurgle. But he did not sink, nor did the other babies. Their rings of dough held them up. Grandma took baby Schmuel by the hand to a floating stump stuck on slightly higher ground as the water crashed by. They shivered and when grandpa came by too they laughed with the fright of their adventure. Soon others in the village came by too. Some had lost their loved ones and cried. Others marvelled at how grandma had helped to keep all the babies alive. Soon the worst of the water had gone by and they could see their homes once again, wet and dripping with flood and torn branches. They set about the long task of repairing what they had thankful to still be alive – and they all decided that all years following they would remember the day. So the next year on the same day – on Rosh Hashanah, the new year – they had a great feast and, with their apple and honey, Grandma baked bread and sure enough she shaped the bread in rings to remember how the ring had saved Schmuel. And just before she baked them, she boiled them to be sure they had enough air to float and save anyone who might need them. When she brought them out hot and sweet, a great cheer went up from the villagers. Ah these must be beigels! they cried. And when people left the village they took the story and their beigels with them and had them to remember that day. Today, some people spell it bagel because it’s easier to say. Grandma Beigel doesn’t mind though.